Live in the future, today! I've been toying with an idea lately. I'd post (once a week?) a concept or preliminary design for an architecture project that I think has a futuristic feel. Then, in the comments, we could all offer our ideas as to what sci-fi universe the design would feel most at home. Does the design look like it belongs on Coruscant or Vulcan? Could it be an example of Forerunner architecture? Today's design is for the Namaste Tower in Mumbai, designed by WS Atkins. 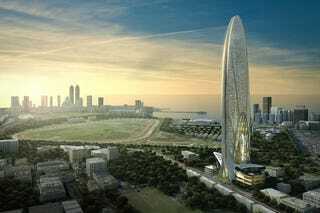 Estimated for completion in 2015, the tower resembles two palms pressed together with the fingers pointed upwards. You can read more about Namaste Tower, and see more pictures, at Inhabitat. So Niners, what universe does Namaste Tower belong in? Serenada, did you publish a book and not tell us?